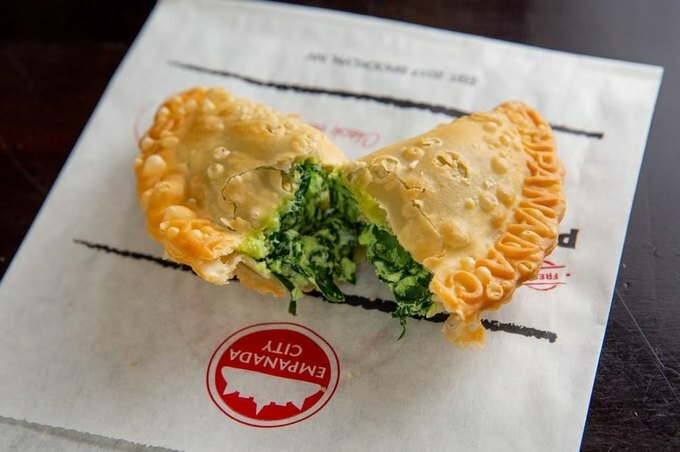 To Jessica and Briant Almonte of Empanada City in Prospect Lefferts Gardens, the flaky half-moon pastries made-to-order tell the story of their respective Puerto Rican and Dominican heritage, as well as their distinctly New York childhoods. Their story has been so successful, in fact, that they will be opening a new, larger location on Starr Street in June. This one with booze. The recipes at Empanada City marry two distinct, though related, food cultures: Puerto Rican and Dominican. One empanada yields a filling of ropa vieja (“old clothes,” in translation), a saucy tangle of stewed, shredded flank steak that is common to both cuisines. The Pastelón comes with the blend of sweet plantains, ground beef, and cheese that is warmly familiar to both Puerto Ricans and Dominicans, and typically shows up in the form of a rich, layered casserole. The recipes at Empanada City come from Briant, his mother, and Jessica’s mother Sonia Rodriguez, a partner in the restaurant along with Jessica’s father. Though some have been doctored slightly to create more American-style amalgamations, like the BBQ Chicken and Pizza Burger, they still incorporate Dominican and Puerto Rican elements. The adobo spice blend accents the sauce in their plain Pizza, and the aromatic mixture known as sofrito underscores the ground beef in the Pizza Burger. The Almontes also take care to reflect the needs of the community in their menu. For example, the restaurant is situated in the largely West Indian neighborhood of Prospect Lefferts Garden, where many residents eat a vegetarian or pescatarian diet. Thus, the Almontes added vegetarian and fish options, like the Bacalao and Vegetarian Pastelón. They plan to do the same at the new location. 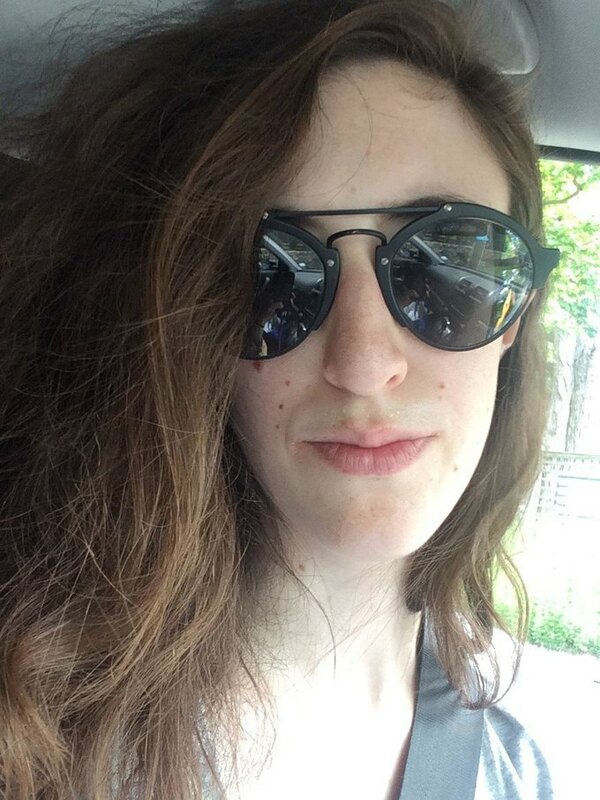 “We just figure we’ll wait to get there, and then see what the community asks for,” said Jessica. The flagship restaurant opened in a building owned by Jessica’s father, but their new location will sit a mere block away from Jessica’s childhood home in Bushwick, on Willoughby Avenue between Cyprus and St. Nicholas Avenues. How does it feel, I asked her, to be opening a restaurant so literally close to home? Setting up shop at 321 Starr St.
Jessica, a former social worker, left her full-time job six months ago. The restaurant was successful enough that the couple no longer needed the extra income. The success shocked even the Almontes: they’d planned on opening their second restaurant in five years, not two. 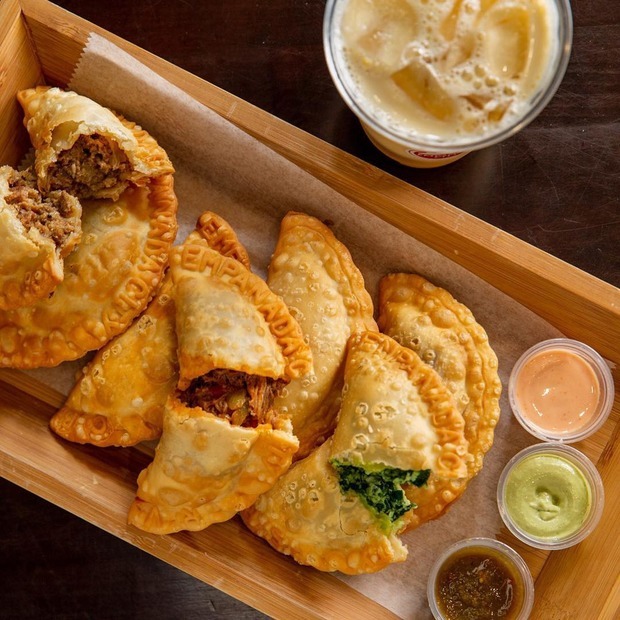 It turned out that a family-owned empanada restaurant was exactly what the community had been missing, and locals have embraced the Almontes and their food whole-heartedly. Since opening, they’ve been “constantly busy,” said Jessica, and are always needing to add on staff. So, the Almontes decided to push their plans forward a few years. A month ago, they found a location for rent on Starr Street that fit their budget and space requirements, and they “kinda just jumped on it,” Jessica said. The new shop will open at 321 Starr Street in June of this year, right near MetroRock climbing gym and Teo restaurant. It will offer the same menu as the original – at least in the beginning. With the addition of a bar, however, patrons can spike the shop’s famous frozen piña coladas in-house, instead of hauling them home to make a DIY cocktail. 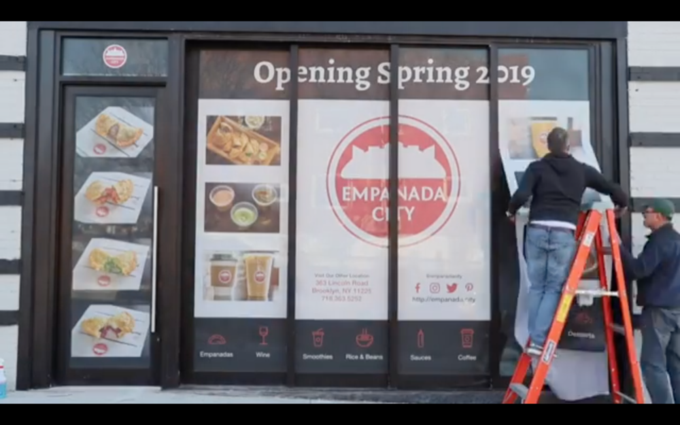 The original Empanada City location is at 363 Lincoln Road, Brooklyn, right off of Nostrand Avenue. If you’re really impatient, make the trip over now for a gooey Pastelón and a fruit-filled smoothie. All images courtesy of Empanada City.